Jessi Combs recently broke a long-standing women’s land speed record (previously held by Lee Breedlove) by reaching a “two-way” average speed of approximately 392.954 miles per hour. 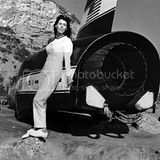 The highest land speed recorded by a woman is 825.126 km/h (512.710 mi/h), by Kitty Hambleton (USA) in the rocket-powered SMI Motivator in the Alvord Desert, Oregon, USA, on 6 December 1976. The highest speed measured during the runs was 843.323 km/h (524.016 mph), although she probably touched 965 km/h (600 mph) momentarily. For those curious at the moment there are two women's records, Lee Breedlove had set her 308 mph mark in her husband's "Spirit of America Sonic 1" jet-powered car, driving on the salt flats at Bonneville. Since Sonic 1 had four wheels, it is considered a "car" and therefore comes under the rules set by the FIA. The vehicle that Kitty O'Neal drove in 1976 had just three wheels and is therefore considered a "motorcycle" and comes under rules set by the FIM. Also, since it was powered by a hydrogen peroxide rocket engine, Motivator reached its top speed much faster than a jet-powered vehicle, enabling Kitty to go more than 512 mph on the relatively short Alvord Desert.